In my first week at the BGC, I was hoarding a huge pile of articles from online resources such as the journal Fashion Theory (which had a couple of special issues on fashion curating back in 2008) and Berg Fashion Library, including entries in Berg Ecyclopedia of World Dress and Fashion and from their fine collection of E-books, as well as taking out stacks of books from the library. Oh, and reading some, of course. Which has been very inspiring and informative, as the wealth of material that is available to me here means that I can truly delve into a select subject, and get some feel of the breadth and depth of the field, following the sources cited rather than stopping short after the first article. My main focus thus far has been fashion museology, which, inevitably, spreads into both fashion theory, material culture studies and general museology. The challenge, of course, is that the chain of references is never-ending, so I must remember not to get too carried away, but what also emerges is a network of articles referencing each other or the same sources, meaning that I can start to identify central discourses and actors in the field. I’m still very much in an absorbing stage, although my supervisors would be pleased to hear that I am trying to start writing, very tentatively, but still. Steele’s words came to mind when this weekend I went to visit the Impressionism, Fashion and Modernity exhibition currently showing at the Metropolitan Museum. It is an extensive and thoroughly enjoyable exhibition produced in a collaboration between Musee d’Orsay in Paris, Art Institute of Chicago and the Met, showcasing an impressive selection of impressionist masterpieces. Clearly first and foremost an art historical exhibit, the curatorial twist is a juxtaposition of the artworks with dresses of the time mirroring those depicted in the paintings, as the focus of the exhibition is how fashionable dress features so strongly in work of the impressionist movement, as a strong signifier for modernity. As Ulrich Lehmann has shown in the book Tigerspung, the literature of the time shared a similar fascination with the sartorial. I’ve never actually managed to read the book though, although it’s been sat on my shelf for years, but today I got through an article of his by the same title, but with a focus on fashion as historical narrative, building strongly on Benjamin’s Das Passagen-Werk (Lehmann 1999). Although it wasn’t a theme of the exhibition, repeatedly I heard people commenting on the tiny waists and sharing with each other perceived truths of the extremes of tightlacing, which, as Steele has shown, was actually not as extreme as common knowledge has it, still, this misconception is very persistent. And a couple of observations made me think of how the exhibition of dress may sometimes serve to uphold such perceptions rather than challenge them, as also pointed out by Steele above. In an exhibit of the paiting In the Conservatory by Albert Bartholomé alongside the dress actually worn by the artist’s wife in the painting (what a scoop!) it seemed to me as if the the dress was presented in a way that actually made the waist seem even slimmer than it did in the painting. This could of course be the posture. 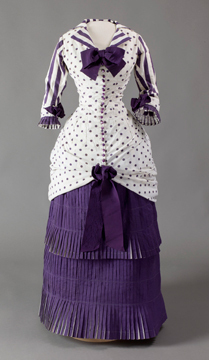 Still, on all the dress displays, the waist was notably slimmer when seen from the front than when viewed from the side – whereas a normal slender torso will look wider from the front than from the side. So was this the effect that corsets actually had on the silhouette – or perhaps in part a result of the design of the mannequins? Maybe I should ask Dr. Steele. Then again, it could be just a trick of my imagination, brought on by a desire to be a clever sausage museologist. 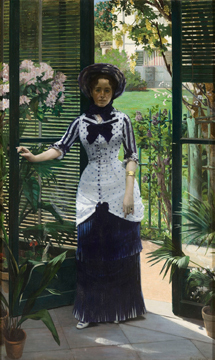 Summer dress worn by Madame Bartholomé in the painting In the Conservatory, French, 1880. Musée d’Orsay, Paris. Ibid. That people were more willing to comment on the fashion than on the painting style (admittedly, my ears were pricked for these conversations so I cannot say for sure that the other was not happening) illustrated well the point often made about fashion’s easy accessibility. Whereas we may be fazed by art, not sure if we’re getting it right or feeling that we don’t have enough of an art historical knowledge to assess what we’re seeing, fashion feels straight forward, something we can understand and relate to in terms of class, taste and (dis)comfort. Spectacular as it was, in terms of traditional museum education, the information on fashion history in this exhibition was however very limited. As for other types of learning, well, that’s another kettle of fish. But I’ll save that for another post.